Don Britt of Snellviile Tourism and Trade Association presents a check for $19,000 to Andy and Paige Copeland. 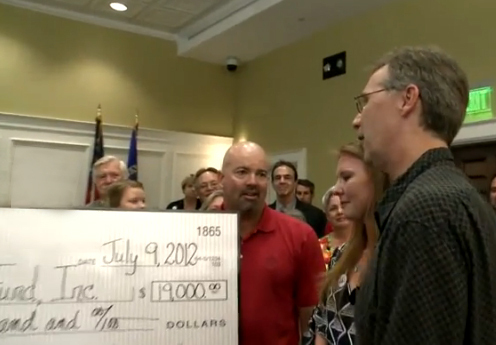 Last Monday evening (July 9th) one of the most rewarding experiences I’ve had as a member of the Snellville City Council unfolded as we presented a check for $19,000 to Andy and Paige Copeland. The actual funds, which were largely raised during the “Aimee Copeland Weekend” benefit concert, will be used to help Aimee’s recovery from surgeries she underwent after contracting a flesh-eating bacterial disease. As Andy and Paige accepted the check, many of the volunteers who worked so hard to organize the weekend’s events and make them a reality, came forward to be recognized, and to share an emotional moment with the Copelands. Whenever I hear the word “community”, I’ll always think of Aimee’s Weekend and the way so many people, from Snellville and beyond, came together to selflessly work for the benefit of Aimee and her family. Some of us had never met before, or knew each other only casually, but we all bonded together in an effort to help. But this being a Snellville City Council meeting, there was no way the glow of satisfaction that comes from working for the benefit of someone else would last very long. I was expecting some spirited discussion over the 2013 budget to put a bit of a damper on things, and as I looked across the audience, I also expected to hear some lively comments in opposition to the firearms ordinance the mayor had brought up for discussion previously. What I didn’t expect was a diatribe by the mayor in which she stated that she doesn’t believe in this Council. Such a statement is insulting, and disappointing on a number of levels. The mayor is part of the Council, so saying she doesn’t believe in this Council says she doesn’t believe in herself, or in her ability to provide leadership. The mayor obviously disagrees with the majority of Council members on a number of issues. Unfortunately, rather than discussing those issues in an earnest effort to find a resolution, she seems to think that using them as a platform for politicizing is the best approach. I can assure you it is not. All it does is breed negativity. I believe our record demonstrates that four of us (Bobby Howard, Diane Krause, Tom Witts and myself) are resolute in doing what we believe to be in the best interests of our citizens. I can assure you that in the future, as in the past, we will continue to do that. We each have our own opinions and priorities, and frequently, that leads to disagreement– which experience has shown can be efficiently resolved with proper leadership and honest discussion. The 2013 budget is but one example. Unfortunately, a number of factors combined to make a farce out of what should have been a routine meeting on June 29th. But all of the wrinkles that resulted from that adventure had been ironed out, and the July 9th budget vote was an ideal opportunity to put a positive wrap on what had been a negative issue. Instead, the mayor chose to make caustic and unnecessary comments that only served to throw more fuel on the fires of negativity. Personally, I believe absolutely in this council. I believe I know the viewpoints and motivations of each member, including those with whom I routinely disagree. And in spite of disagreements, I believe that we can and will reach the consensus needed to do what’s best for the city and its citizens. The mayor can either join in that positive process, or continue to be a source of negative image for the city. The choice is hers.